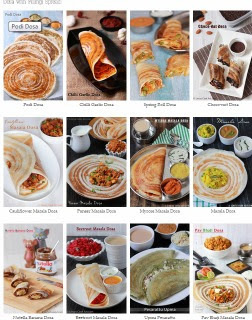 Chicken Masala Dosa: I have shared some of the dosa varieties for the two weeks and today i have come up with a non vegetarian version of the stuffed dosa which is so tasty, easy to make and absolutely filling. You could make this for weekends and also for kids on other days too. A simple and delicious dosa. I had prepared this dosa this weekend; it makes my work so easy than other non-veg dishes require rice or rotis with that which takes most of the time. Dosa cooks in a minute and the preparation of the filling is also so easy. You could boil and add one potato to increase the volume of the filling too. Heat oil in a pan, add the onion and cook till the colour changes pale. Add the ginger garlic paste or chopped; saute till the raw flavour leaves and the colour of the onion starts to become golden. Now add the chopped tomatoes and cook till soft and mushy. Now add the finely chopped chicken pieces, salt and the masala powders such as turmeric powder, chilli powder, coriander powder and garam masala powder and mix well. Cook till the chicken pieces cooks well and becomes almost dry masala. Using a sharp spoon or ladle cut the chicken to break the chicken in to smaller pieces to coat the masala well. Sprinkle coriander leaves and mix well. Heat a dosa tawa and grease with oil; Take a ladle full of dosa batter and make concentric circles. Drizzle half a teaspoon of oil over the dosa and keep a scoop of fiilling on top of the dosa; roast till the dosa becomes crisp and golden. You could make rolls out of this dosa and cut diagonally and serve like sandwich roll.